This is, hands down, my favorite time of year. There are so many great aspects to the Christmas season - good food, good music, and the special traditions that come along with the "reason for the season." I think you all remember how I feel about the commercialization of Christmas!! So if our family decides to do some extra work of charity for four weeks, or even simply gives up candy - we are all the more excited for Christmas Day when we can eat our favorite junk food again! We countdown the days of Advent with an Advent Calendar and the Advent Wreath. This usually begins on the First Sunday in Advent and goes all the way until Christmas Eve. But the first exciting celebration in Advent is St. Nicholas' Feast Day! On the night of December 5th, our kids make sure the stockings are hung for St. Nicholas to fill with goodies. This comes from the historic tale of the real Saint Nicholas, a Bishop, serving the less fortunate. Nicholas' parents died when he was young and left him a great fortune, which he chose to share with others. Not wanting recognition, he would sneakily leave these riches in a family's left out shoes (hence the stockings) or even through and open window or chimney (hence the Santa comin' down the chimney tale). This was his way of helping out those in need but not getting all kinds of glory for it. This is a great lesson to teach our children of today...helping others without seeking some kind of earthly reward or recognition makes it truly selfless. So on the morning of December 6th, the feast of Saint Nicholas, the kids get to open their stockings full of goodies, small toys and, of course, some chocolate gold coins! Another "lesson" we teach our kiddos makes use of a long-standing Italian tradition - Il Presipio - the Christmas Crib. Saint Francis of Assisi (yep, an Italian!) is credited with constructing the first Christmas Crib, a replica of the manger to be displayed during the season to recall Jesus' birth. But you won't find the Infant Jesus in our Nativity scene!! After all, He isn't actually "born" yet! Our Presipio includes only Mary, Joseph, and an empty crib, which the children fill with hay each time they do a good deed. So if my little ones do an extra chore or obey me without a complaint, they get to put a piece of hay in the crib, thus making a more comfortable bed for the Child Jesus come Christmas morning. This is a fabulous reminder of the reason for the season that little minds can understand! Then there's Christmas Eve - La Vigilia!! The Feast of the Seven Fishes is celebrated by Italians everywhere! Being a "Vigil Day" - (which basically means it is the Eve of a great Feast Day) the Church has long required fasting from meat on this day in order to prepare oneself for the great feast that is coming. Consequently, Italians have more than risen to the occasion with tons of great fish dishes (usually seven to symbolize the seven Sacraments of the Catholic Church). You can read about some great recipes from Dominic Condo and myself from our Seven Fishes Post last year. Then, of course, CHRISTMAS DAY!! The morning of Christmas, we are all usually pretty exhausted from Midnight Mass - but the kids are excited for their presents from Babbo Natale. But before any gifts are opened, the kids - walking in procession led by the youngest - carry the baby Jesus (statue) in and place it in the Manger that they have been filling with hay all Advent long. We are then reminded that Jesus' birth is at the forefront of our Holiday celebrations. Of course, Christmas Day (and beyond) means a house full of sweet treats and goodies. 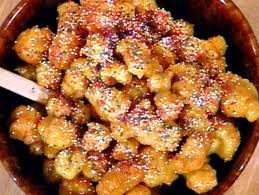 Struffoli is a festive Italian dessert that my kids love! It's fried balls of dough tossed in honey and sprinkles. You can even use red and green sprinkles to keep it festive! We also always make a Cornflake Wreath, a kind of Rice Crispy treats. Replace the rice crispies with corn flakes and use green food coloring after you melt the marshmallows. Then place into a bundt cake mold until hardened. When flipped over on to a plate, decorate it with red mini m&ms (to look like holly berries) and a red bow on top. This is what we hand out to our friends and neighbors each year. A Christmas "wreath" that is way too easy not to make! Our celebrating season comes to an end on January 6th with Epiphany. This is the day the Catholic Church celebrates the coming of the Three Wise Men to the Christmas Crib. So, like any good Italian, we put out our slippers on the Eve of Epiphany (the night of January 5th) for La Befana to fill. The Story of La Befana is a long standing Italian tradition that my kiddos love! The story goes that this good old Italian "witch" was at home when three men knocked at her door asking directions to the stable where the King was to be born. Engrossed in housework, she neglected to accompany them on their journey and stayed at home to sweep! Later on, feeling remorse, she set out on her own journey trying to find the Newborn King, so that she could leave him a little Birthday gift. Since she was unsure which baby it was, she just left treats for each child she passed, hoping one would end up being the Christ Child! La Befana visits us every Epiphany, and somehow always brings my husband's favorite candy! These traditions are truly what make the Holiday Season such a memorable time for our family. My husband and I feel it is so important to give our kids these memories to hold on to as they grow older. That way, they learn the true meaning of the season in a fun way, and could even celebrate with their own families one day. Great to hear that the Church and Our Lord play the central roles in your family's celebration! Does your family celebrate Christmas in the Traditional, Tridentine Rite of Mass, too?